The Veils seem to have lost confidence in their earlier work without having a clear idea of where to go next. There’s a pretty good case to be made that the Veils' 2006 release Nux Vomica ranks highly on a list of the most unfairly overlooked albums of the last, say, 10 years. It was a strange joy of an album, a wide-ranging, delightfully over-the-top blend of Nick Cave and Jeff Buckley and Rufus Wainwright and more besides. In the post-Strokes love-affair with all things indie and post-punk, though, that kind of swooning theatricality might have been a tough sell -- Cave himself was in a bit of a somber lull at the time, with the sleazebag rejuvenation of the first Grinderman album still a year away. What chance a band based much of the time in New Zealand, previously distinguished mostly for its singer’s nice eyes, and fresh from a major change in line-up and sound? The album made end of year lists, but in the years that followed wider acclaim seemed elusive. In part, that’s probably because the Veils weren’t quite able to capitalize on Nux Vomica’s creative success. The follow-up, Sun Gangs, took three years to release, and though it was a fine record with some outstanding moments, it didn’t quite capture the magic of its predecessor. The band then seemed to disappear from view. They left their esteemed label, Rough Trade, later the same year, and early in 2010 released a very puzzling, disjointed EP on their own label, Troubles of the Brain, which was markedly different from most of their earlier material in style and substance. Troubles of the Brain seems not to have been just an experiment. As on that EP, the flamboyant drama of Nux Vomica, with its eclectic, baroque arrangements and frequent use of piano, strings and soft backing vocals, has been sidelined. Instead, on many tracks we have a thinner, more guitar-based sound similar to post-punk revivalists like Interpol and Editors. Perhaps that had something to do with the departure of keyboardist Liam Gerrard after Sun Gangs. But along with the tighter musical style the extremes of Andrews’ singing have been reigned in; in both cases, it has made the band sound more conventional, and less interesting. There is certainly nothing on Time Stays, We Go like the ornate, gorgeous melancholy of Nux Vomica’s “Under the Folding Branches” or the jaunty, wry pop craftsmanship of “Advice for Young Mothers to Be”, or the rabid mock-pulpit-bashing of “Jesus for the Jugular”. Still, the album begins promisingly enough with “Through the Deep Dark Wood”. It has a more expansive 'rock' feel than the band has featured previously, reminiscent of the lush drum and reverb-heavy guitar sound on PJ Harvey's Stories from the City, Stories from the Sea, and it works here. Unfortunately, though, the impact of “Through the Deep Dark Wood” is undermined by the series of dull, rather misguided songs that make up the rest of the album’s first half. “Train with No Name” is an attempt at the slow, gentle burn of Arcade Fire’s The Suburbs – Andrews’ phrasing even sounds like Win Bulter’s – but the song is stuck in neutral. “Candy Apple Red” and “Dancing with the Tornado” are worse. The former is a drifting, aimless piece of atmospherics that's blighted by teeth-grinding lyrics, too-easy rhymes and half-asleep singing: “Took me by surprise / How the time just flies / In my baby’s eyes / In between those thighs / No I won’t forget my baby darling” etc etc). The latter attempts to raise a bluesy ruckus in the mold of some earlier Nick Cave tracks, but doesn't have the imagination or personality to pull it off, with Andrews' voice reduced to a strange, strangled croak. “The Pearl” sounds like an attempt at the creepy vibe of the slower Grinderman tracks – “She’s 19 in blue jeans / Don’t even know what love may mean” – but again it’s not a personality that Andrews inhabits easily, and the song drags. These tracks all come in at around four minutes long, but they’re an endurance test nonetheless – without checking I would have sworn they were almost twice as long. If the album's first half is a disappointment, things do improve on the back side. “Turn from the Rain” is the first track that really recalls and expands on the best of the band's earlier work. The song, what sounds like a cautionary tale about fear and missed opportunities, has a jaunty momentum and interesting instrumentation, especially the straight-outta-Calexico mariachi horns. “Birds” is a grim, slightly silly little ballad that possibly overplays its hand a bit but is enjoyable besides. On another, darker album the song’s story of birds calling out lives meaning nothing and prices being placed on heads would be more credible. Still, it’s good to see the band taking these sorts of risks. Things continue to improve as the album draws to a close. “Another Night on Earth” sounds like a companion to “Turn From the Rain”, a sweeping, foot-tapping track that opens with a tinkling piano and soft oohs, and ends in aching horns. The song finds Andrews taking on the wordiness, flat phrasing and sorrowful introspection of Conor Oberst – it’s another new persona for Andrews, but a more successful one. Then belatedly, almost as a taunt, Andrews rediscovers the rich, characterful singing voice that flourished all over Nux Vomica on the album's final and best track, “Out from the Valley and Into the Stars”. It’s such a lovely, gripping song, with subtle moments of dark and shade, that as the song finishes in a burst of organ you can’t help but wonder where this sort of talent has been over the course of the rest of the album. In the end, it's hard to know what the Veils were trying to achieve on Time Stays, We Go. For all its relentless lyrical focus on Andrews' abiding interests in love and death, musically the album feels like a disjointed, poorly-sequenced grab-bag of ideas rather than a coherent album, and the fire seems to have gone out of Andrews' performances. That's especially surprising from a band whose earlier work had been marked by its commitment, passion and clarity of purpose. Of course, a band can't stay in one place -- no one would have wanted to listen to Nux Vomica remakes for eternity. But the Veils seem to have lost confidence in, or the ability to recreate, their earlier work without having a clear idea of where to go next. On Time Stays, We Go, as on their previous EP, the band seems to be trying on a range of ideas and identities, without being willing to really commit to anything. Right now the band feels, to quote Andrews back at himself, not quite revived and not yet mourned. 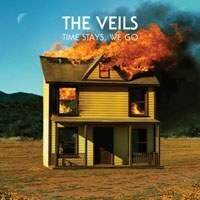 Hopefully the Veils find a way to rediscover their best form but no... not yet.